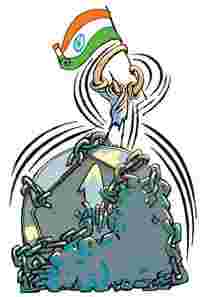 Through most of its first 60 years as an independent nation, India has been run on the basis of a muddled assumption. It was assumed that the average Indian was intelligent enough to choose his political representatives in free elections, but was not intelligent enough to choose what to buy and sell in a free market. In other words, we have had to live in an open society and a closed economy—a curious mix of freedom and control. This muddle can help explain many of the challenges and dilemmas of contemporary India. Democracy and social mobility helped break some of the old social constraints such as caste and gender, and stoke the aspirations of the Indian people to lead better lives. But, at the same time, these rising aspirations could not be adequately met —thanks to a controlled economy that condemned us to low rates of growth. On a day of flag-waving, let’s face a brute fact: Independent India has failed to meet the goal it set for itself 60 years ago. “The service of India means… the ending of poverty and ignorance and disease and inequality of opportunity," said Jawaharlal Nehru in his famous speech on the eve of independence. Can we honestly say we have delivered on that promise? One builds on the other. A free economy can unleash the sort of growth that is essential to pull people out of poverty and offer them the chance to craft a better life. But it is difficult to build such a free economy in the long run if we do not have a political system that is based on freedom and the rule of law. Democracy is not a burden on the economy. And no amount of pointing towards China can obliterate this truth. After all, China’s economy took off in the late 1970s only when it discarded the mad totalitarianism of Mao and took baby steps towards a slightly more open political system. It worries us that even as the economy is liberated from suffocating controls, there are renewed threats to political freedom. These come from not only extremist movements, but also from growing religious and caste intolerance. While democracy is an absolute good, it is also good to remember that enterprise and innovation (the foundations of economic growth) cannot flower in a land where the mind lives in fear. Underlying India’s success as a democracy is the Constitution. India needs to nurture its constitutional foundations if it has to move towards prosperity. In his last speech before the constituent assembly on 25 November 1949, B.R. Ambedkar asked what it would take for India to maintain democracy in form and fact. “The first thing we must do is to hold fast to constitutional methods for achieving our social and economic objectives. It means we must abandon the bloody methods of revolution. It means we must abandon the method of civil disobedience, non-cooperation and satyagraha," he said. Legal means need to be embraced in many other walks of life as well, including business. A combination of constitutional democracy and an open economy will offer India its best chance to break out of economic poverty and social oppression. And hopefully it will take us far less than 60 years to get the job done this time around.